When one hears the words “cross country”, images of sweat-drenched runners, gasping for breath and faces contorted with agony, immediately come to mind. Indeed, cross country is undoubtedly a very demanding sport, both physically and mentally. It is not uncommon for our friends to question why we willingly subject ourselves to what saner individuals would consider torture on an almost daily basis. “Why do you run?” This is the ultimate question and one that will be posed to every runner at least once in his or her lifetime. The legendary American distance runner, Steve Prefontaine, attributed his love for running to “self-satisfaction and a sense of achievement”. Furthermore, in a hectic, convoluted world, the sheer simplicity of running is a much-welcome breath of fresh air. Sir Roger Bannister, the first person to run a sub-4 minute mile, mused that humans crave freedom and that “the more restricted our society and work become, the more necessary it will be to find some outlet for this craving for freedom”. No one can tell you that you cannot run a bit faster or push a bit harder. Thus, in this regard, it can be said that running, at its most fundamental, is a testament to the indomitable human spirit. 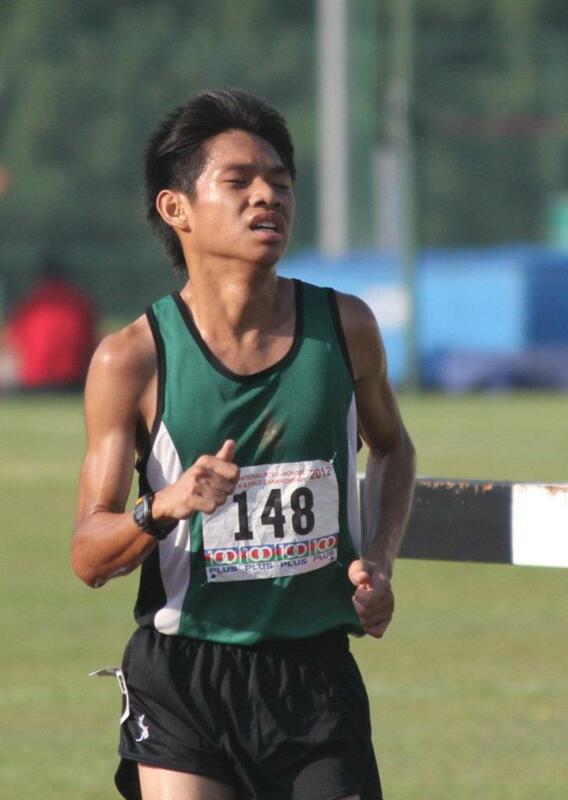 That being said, Raffles Cross Country (RIXC) is about so much more than just running. Our coach, Mr Steven Quek, and teacher-in-charge, Mr Tay Meng Kiat, always try to build our characters by imparting values and life skills during training sessions. Contrary to what some believe, cross country is a team sport. When the going gets tough, we are secure in the knowledge that we can rely on our teammates for support. We go through so much together during training that it is perhaps inevitable that we are an extremely bonded CCA. To paraphrase Shakespeare in Henry V, “We few, we happy few, we band of brothers; for he today that runs alongside me shall be my brother.” Our seniors are also a perennial source of support and encouragement. RIXC has a massive alumni base and it is common for us to train at least once a week with our seniors, some of whom are now top local runners. At races, RIXC alumni turn up in droves and their exhortations help spur us on to dig deeper and run just that much faster. Medals galore at the 53rd National Inter-school Cross Country Championships 2012. 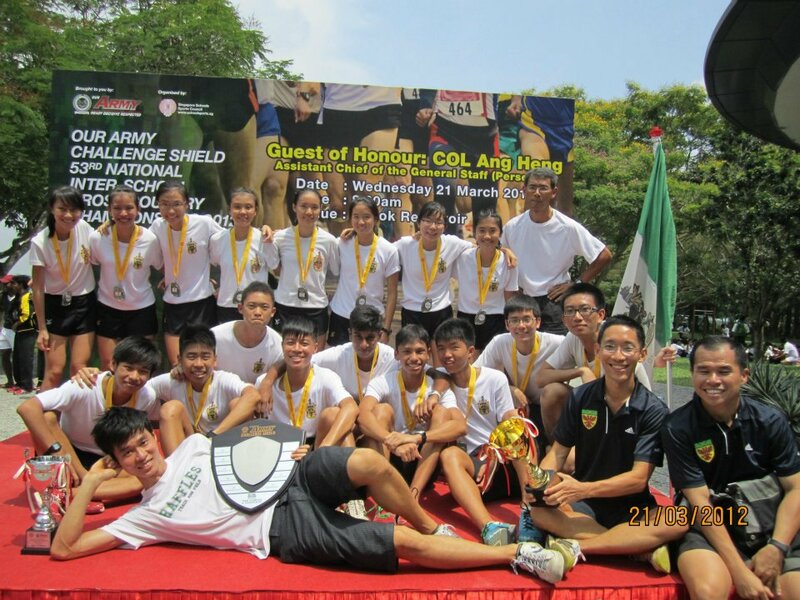 Our A Division Boys took home the Champion’s Shield while our A Girls emerged as 1st Runners-Up. While our training is hard, it is by no means overly demanding. We train 3 times a week at a plethora of diverse locations, ranging from the school track to MacRitchie Reservoir, with training sessions being carefully tailored to each individual’s fitness level. Soon after joining cross country, you will begin to see a marked improvement in your cardiovascular fitness. Seemingly insurmountable distances, which once invoked visceral fear, will eventually be scoffed at contemptuously. And of course, you’ll be the envy of your classmates whenever it’s time to run 2.4 km!